Congratulations! When you’re eligible for a Klout Perk, all you need to do is claim it and you’re on your way to enjoying a special treat. 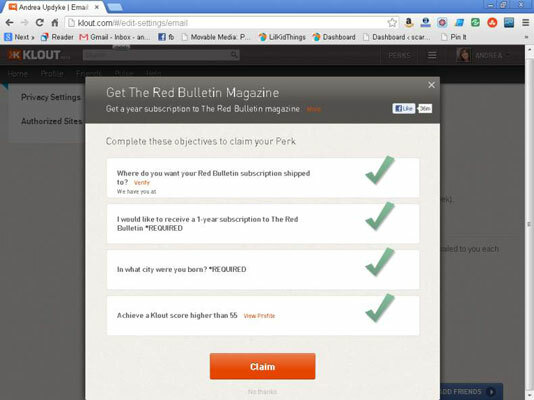 If you see a Klout Perk you want, claim it right away! Perks are limited and awarded on a first-come, first-served basis. If the Perk is full, you may be allowed to join a waitlist. Sign in with either Facebook or Twitter. 2If you have a Perk, your notifications menu will show a number over the word Perks. Click Perks to open the menu. The menu will open and display your current Perks. 3If you wish to claim your Perk, select it from the menu. A pop-up appears, with instructions to claim your perk. Here, you can read a little more about the offer and decide if you want to claim it. 4To claim the Perk, click the orange Get Started button. A window opens with further instructions for how to claim this Perk and sometimes includes some of the criteria used to award you this Perk. 5Verify or enter your address in the fields provided and click Claim to complete the process. If you would like to save time when claiming Perks in the future, be sure to enter your contact information in your Profile settings page. By doing so, Klout stores your information so the next time you claim a Perk, you’re asked only to verify your mailing information. If your Perk is related to an online benefit, you may be given a code or directed to the retailer’s website to claim your Perk. 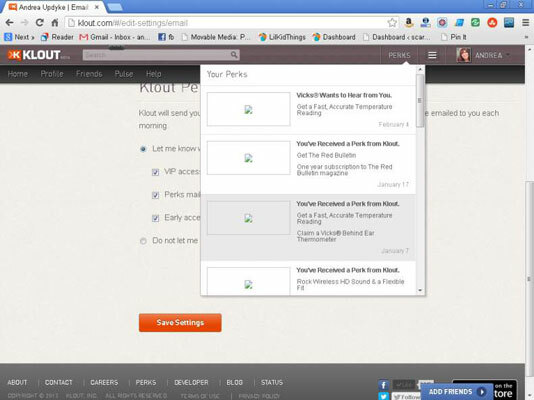 If you don’t want to do it right away, this information is available to you anytime you log in to Klout.